Quick Cage (DSLR, Large) is a quick release, height adjustable cage that fits larger DSLR cameras like Canon 1DC, 1DX, 1DmkIV, 1DmkIII, Nikon D4, D3x, and many cameras with battery grips installed. It is important to note that if using a battery grip, the tripod mounting point must be directly under the center of the lens axis. It attaches by one low profile screw on bottom and shoe pinch on top. The minimalist design gives you mounting points on the top and side while leaving all of the camera's vital controls on the right grip and left side easily viewable and accessible. Fold out LCD screens can be positioned easily and eyepiece can be utilized while cage is attached. Quick Cage (DSLR, Large) includes a quick release dovetail which can attach to tripod plates or existing 15mm support bases. To quick release out of dovetail/baseplate, turn thumbscrew and depress pin, move camera toward rear, and remove. 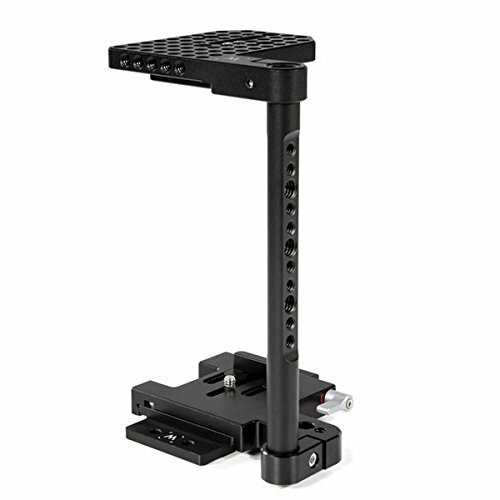 The quick release dovetail can also attach to any ARRI standard bridgeplate such as Bridgeplate (19mm) or Bridgeplate (15mm Studio). When studio rods are not needed, a Dovetail Clamp can be added instead to interface with 2060 Dovetails, Safety Dovetails, or Shoulder Rigs. If lightweight 15mm support is needed, combine with DSLR 15mm Bracket.